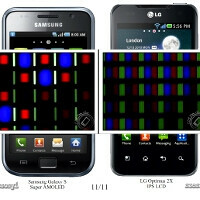 Creative Hungarian reviewers of the LG Optimus 2X have decided to enlarge with a microscope sections of the IPS-LCD and Super AMOLED displays on the Optimus 2X and Samsung Galaxy S, respectively, clearly showing the disadvantages of the PenTile matrix arrangement in the Super AMOLED technology. A guy named Székely Zoltán has then created one awesome Flash-based interactive tool, which visualizes how the screens look like under eleven times microscopic enlargement for the review, and was reposted on GSM Arena, from where we are embedding. Since we pitted the other day the Super AMOLED Plus screen on a Samsung Galaxy S II prototype, against the IPS-LCD of the iPhone 4, and the Super AMOLED on the Galaxy S, we decided that this great tool can demonstrate perfectly why some picky users scoff at the use of the PenTile matrix. It uses less subpixels per pixel to create an image, arranging them in a creative geometric pattern, inspired by the human retina, and the company that invented it was acquired by Samsung in 2008. This brilliant interactive tool of Mr Székely comes extremely handy in visualizing the disadvantages of the PenTile arrangement. It is clearly seen that when you start zooming into the individual pixels, the number of subpixels on the Galaxy S screen is way less than the number of subpixels that build the IPS-LCD display on the LG Optimus 2X, which uses a normal RGB matrix, despite that both are the same size and resolution. The tool allows you to compare IPS-LCD with the other LCD variants, like Super LCD, too, for a better understanding of the technology behind them. LG's phone is used for a reference point here, since the tool is embedded into its own review on the Hungarian site for illustration purposes. We wanted to show you how the PenTile matrix arrangement in the Super AMOLED displays effectively lowers the perceived resolution, making text and other details appear less distinct on the Galaxy S, then on the Galaxy S II, despite that they are of the same official 480x800 pixels resolution. The thing is that with the Super AMOLED Plus technology Samsung reverts back to the normal RGB matrix arrangement, which uses more subpixels per pixel, thus improving the quality of the perceived detail. In fact, Sammy said that the Super AMOLED Plus display on the Samsung Galaxy S II has 50% higher subpixel count than the display on the Galaxy S, and that's precisely because Samsung ditched the easier to produce PenTile matrix, and used a normal RGB arrangement for the Galaxy S II, which it calls Real-Stripe matrix. For more information about the various technologies behind today's smartphone screens, you can read our in-depth article here. Ok. i read a part about comparing phones displays but i see no comparison taking place??? -__- bad title. Galaxy S 2 will be the first phone with a screen better than my 2 years old Omnia HD... Even with higher res and size of Galaxy S, the Omnia HD screen is much clearer and more detailed. You can hardly see the pixels because of thr RGB arrangement. Pentile looks like it has huge pixel spacing. I hope the price won't be crazy, or i will have to buy Optimus x2, and i'm addicted to amoled's true blacks. Quit spammin' and postin' useless shiit u qweqwr!! oh, i just wanted to point out something They have the "HD2" as "LCD". It was infact an AMOLED display. OI.